You guys … I’m at the end of a very short fuse today and I have no idea why. Maybe it’s the heat. Maybe I’m hungry. Maybe I need a nap. Who knows. I just know that I’m getting pissed off at the drop of a hat so everyone better watch out! It started after I got up early to feed Riggins and went back to sleep. I had a nightmare that I was employed for this horrible company with a horrible boss (real boss from ions and ions ago). She was a disaster and off doing who knows what, so I had to take over, but really couldn’t because some of her minions were being moronic and annoying. Anyway, I had Riggins with me and he would take on anyone who pissed me off (probably due to my reading a few chapters of Game of Thrones before nodding off to sleep — i heart direwolves). Finally the big wigs of the bigger company that had just acquired us decided my ridiculous boss needed a big ol’ award, and I lost it. I strolled right up to that big ol’ boss and gave him a piece of my mind! Upon waking I decided to go see World War Z. Mostly because Brad Pitt is the dreamy-ist. I was starving so ducked into a store to get a bagel and ate half before putting the other half in the bag to save for a post movie snack. Upon entering the theatre I was told I could not bring outside food in. I tried to explain that I wasn’t going to eat it and planned to purchase popcorn from the theatre but the ticket man would have NONE OF IT. I really don’t know how I got out of the stand-off. I think he just knew he needed to back off. I pushed the bagel bag in my purse, all the while him explaining how that wouldn’t help, and walked past him. I don’t know what makes me more irate … being told what to do (which I have a strong emotional and primal response against) or horrific customer relations. Why are movie theatres so bad at customer service? I find it baffling. All of them are. I’ve boycotted almost every theatre in the LA area at least once due to a bad experience. It seems so easy. I SO NEED a big movie theatre chain to hire me as the customer service expert to modify and fix their “procedure manual” and train their employees. By the way I totally ate the other 1/2 of the bagel during the movie out of spite. On my way home I stopped at Petco to get some Riggins food. As I was balancing a 25 pound bag of dog food on one hip/arm and grasping a 10 pound treat box in the other arm I was run into, cut off, and fully annoyed by two Glendalians (mother/daughter I assume) who had their itty bitty dogs in individual shopping carts. Heaven forbid the little darlins’ walk around the dirty ol’ store all on their itsy bitsy own. The women were the WORST. Since they made a dash to the check out to get their before me you would think they would be ready to check out. Oh no …. I stood there with my arms full and aching while they talked and debated and disagreed and then asked the dogs their advice — about purchasing a specific dog treat at check out. Even the cashier looked at me and rolled his eyes. Grrrr. Then I made the mistake of going to Trader Joes in Glendale which is really just asking for it. Nothing specific happened but I did glare angrily at no less than 5 customers and 1 employee. You will just have to believe me when I say they deserved it! Sigh … I need to chill out. “Chillax” as my sister would say. Well first I have to wash the dishes and go work out. Then I can sit down and sip on some wine in my newly decorated wine glasses. Anna came over this weekend to do “crafts” (aka eat cheese and drink wine) and we each designed a set of custom wine glasses (or juice if you are one of Anna’s kids). Anna expertly put initials on each of hers. A feat I was in awe of since I have failed every single time I’ve tried this seemingly easy task. I put the silhouettes of some of my dog visitors on mine. I think they all turned out very well! (Directions how in original glass decoration post). I also have two adorable dogs coming to stay with me starting tonight. 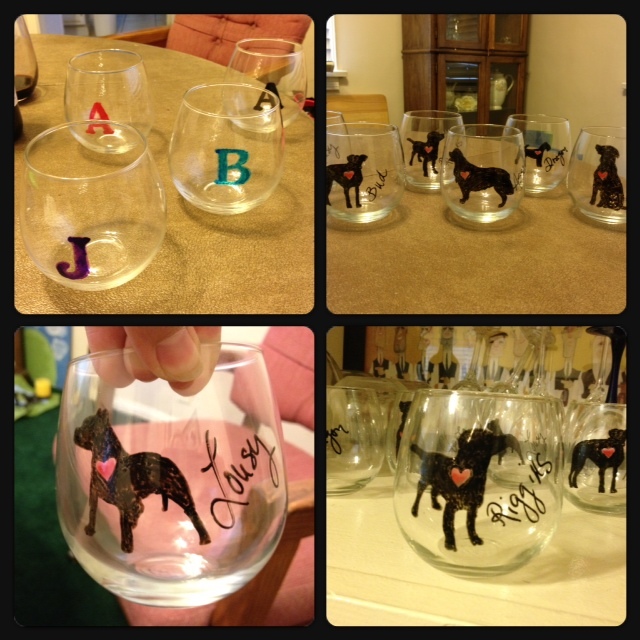 Wine out of a classy glass and cutie pie dogs … that should snap me out of this funk! Drink some wine and chillax!